When it’s time for you or your business to post a Web site, you’re faced with the prospect of building it yourself or hiring a designer. Even if you initially hire a Web designer, you’ll still need to update the site periodically, either paying for such services, or taking over the process. Either way, you’ll want an affordable program that you’re comfortable using. Freeway 5 Pro (version 5.2), or even Freeway Express, fits the bill whether or not you’re a professional designer or have Web design experience. Freeway comes in two versions—Pro and Express. Express is enough for most people to create a professional-looking Web site with considerably more features than Apple’s iWeb ( ) offers. The Pro version offers capabilities that professional designers are used to, such as Styles. It also lets you to create a pure CSS site—the Cascading Style Sheet code standard preferred by the W3C (World Wide Web Consortium, the Web standards group). Express uses some CSS, but also employs the older HTML tables method to create your page structure. Neither structural model is visible to the viewer, and both methods look and perform fine for the most part. The Pro version also has some site management perks such as the ability to view a Link Map of all page relationships, and it allows you to use more third-party actions—various add-ons to add interactivity to your site. The look and feel of Freeway 5 is very much like those of Apple’s current iApps or Mail ( ), so you’ll easily recognize the controls. The page design interface is not much different from a page layout or illustration program such as Pages ( ), InDesign ( ), Illustrator ( ), or QuarkXPress ( ). A main window features the page you’re designing. There’s even a pasteboard, in the style of some print design apps. Like almost any program, you have a few floating palettes in which you can choose item-specific settings. Freeway 5 Pro’s Page window and its two most commonly used palettes. A Web site is a collection of linked pages. So, instead of opening a single page or document in the Finder, you open a site file, so Freeway can intelligently manage your links and content. Launching a site opens a main window that lists all of your site’s pages on the left (think iTunes ( ), iPhoto ( ), or Mail) and, when you double-click on a page, it appears in the main area of your window. At the bottom of the main window is a pop-up link menu, which lets you easily link any text or graphic on your page to any other page in your site or to any URL. There is also an attached Site Panel that lists your pages; you’ll find the pages listed in a section on the left and controls at the bottom that let you add pages. Just double-click on any page icon to open and work on that page. As you place text or media on your Web page, Freeway lists the item in a collapsible list below that page’s icon. Because pages must be linked together, the main window has a Link Menu as well. Unfortunately, the program still does not facilitate multiple undos and cannot import existing sites. 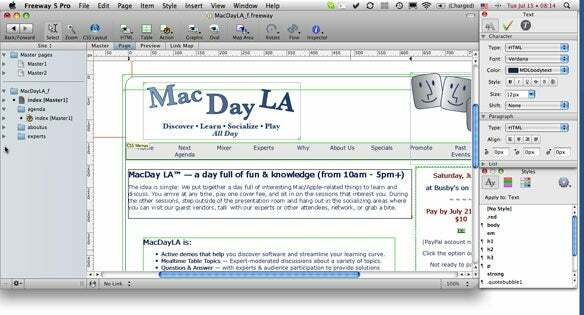 The actual page design technique in Freeway is familiar. To add text, click on the HTML button; drag across the page to define the text area; then type, paste, or insert text. The fun comes when you use the inspector to create borders for your text sections. New to version 5, you can add a glow, drop shadow, customized rounded corners, and more. Add graphical elements anywhere by either dragging images onto the page from the Finder, pasting them into the page, or using the File:Import command. You can use high-resolution images from Photoshop or Illustrator. And, new to version 5, you can import images directly from iPhoto. Freeway features a surprising amount of image-formatting capability, including cropping, rotation, framing (borders, shadows, effects), and compositing. You can even edit your image in its native app while it’s on your page. Whatever edits you apply to your image, Freeway generates an optimized image upon publishing—a great time-saver. Adding an audio or video file works the same way as images. Freeway automatically detects whether a file is in Flash, QuickTime, or MP3 format, and changes inspector options contextually. Freeway 5 introduces pure-CSS menus, a W3C standard. These are very easy to create by first setting up a hierarchal bullet list and applying the new built-in CSS Menus action. You can apply a link to each list item at any time. One long-standing problem with Web pages has been that when an e-mail address can be detected by a robot, that address is likely to be harvested for spam. Freeway 5 automatically masks e-mail addresses. In addition, Freeway 5.2 automatically optimizes your pages for iPhone design with sophisticated features such as scaling and viewport sizing, which uses CSS to determine monitor dimension. There’s also a new link type called tel for the iPhone auto-calling feature. Freeway 5 also includes actions for Google Maps, AdSense, RSS feeds, and Blogger. Plus, it provides great accessibility reporting. If you intend to create pure CSS layouts, look for the skeleton templates in the templates section of the Web site. There is a learning curve to using CSS for your page layout, even with an easy-to-use app like Freeway. But Softpress’s QuickTime tutorials and other abundant support are helpful. Freeway 5 Pro (version 5.2) is a good choice for professional designers who do not want to learn HTML and CSS. It will help you build unique sites that are not designed from templates and that meet required accessibility standards. For current users, the iPhone update is just one of a host of high-profile improvements and altogether, the enhancements in this version are well-worth the upgrade price. If you’re new to Web design, and Freeway Pro seems too intricate, Freeway Express is also a great choice for $79. Plus, it’s easy to move to the Pro version if the need arises, as the interfaces are almost identical. Deborah Shadovitz is the author of Adobe GoLive 5 Bible (IDG Books, 2001), penned Mac Design’s GoLive column, and was a contributor to SBS Design.